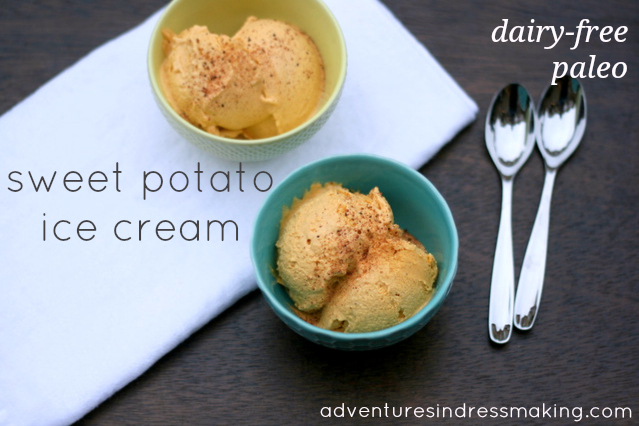 Seriously amazing - sweet potato ice cream. Yep. I've been all about this ice cream since I made it Sunday. 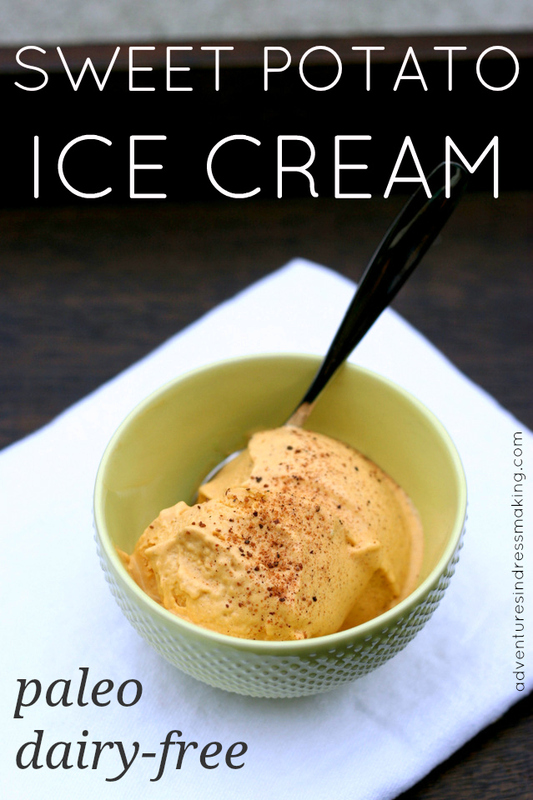 I've been thinking about a seasonal, homemade ice cream-like creation since having my mind blown when I read about butternut squash ice cream, and have been really enjoying "not sweet treats" made at home with things like coconut milk, cocoa powder, frozen banana for sweetener, almond products... since our 21 Day Sugar Detox in January. So, I am sooooooo excited that I successfully made my own variation on a winter slightly sweet vegetable dairy-free ice cream dish, and after the interest it got on Instagram on Sunday, I got my act together and got ready to post about it! Note: You will need an ice cream maker for this recipe - we use a very basic on/off ice cream maker from my mother-in-law - you may be able to find a friend or relative who will lend you one, or treat yourself and buy one of these Cuisinart ones (they come in cute colors!) for only $40! Most basic ice cream makers involve a metal insulated bowl you store in the freezer when not in use, and a simple motor base you put it on with a cover. Or, you can go all out and buy this plug-in one that freezes it for you while it works. My friend Jessie bought one of these and it is very cool!! 1. Bake or microwave the sweet potato till it's soft. Baking is probably better but I didn't have my oven on and didn't want to turn it on for one little sweet potato, so... I microwaved mine for 7 minutes. 2. Blend the sweet potato, coconut milk, coconut oil, and maple syrup or honey in a blender till smooth. This will also cool it off a little. 3. Add eggs and spices, blend. 4. Pour the mixture into an ice cream maker and turn it on. That's it!! When I served this to husband we got a little ice cream sundae bar going and I brought out toppings--coconut flakes, raw cashew chunks, nutmeg for sprinkling... yum yum! It really does taste a lot like pumpkin pie, although less plant-ey, you know how pumpkin sometimes has that taste? This was pure richness and delicious spice. It got all the raves from husband. And hey, what a great dessert; it has vegetables in it! ;) And it was the perfect dessert after dinner last night following a kettlebell class workout. Yay safe starches! oooooooooooh yes please. gah i wish we had an ice cream maker!!! This looks so amazing! I've been needing to cut out sugar but I've gotten used to a sweet treat a few times a day. This would be a fantastic alternative! I'll have to borrow someone's ice cream maker. Wait, I've always thought that if it tastes good it was bad for you! Thanks for proving me wrong! This looks and sounds amazing! I don't eat a lot of ice cream because I'm lactose intolerant and will suffer later, but with coconut milk this would work for me! Now I just need to get an ice cream maker... Also, those bowls are so cute! Totally! I don’t tolerate dairy, either, and I don’t use dairy substitutes much except for recipes like this one! Coconut milk ice cream is delicious; just gotta add enough fat from coconut oil/butter/egg yolks to make it smooth and soft! I am an alum of Mississippi State University. They have produced sweet potato ice cream--but, like most of their ice creams, it isn't very good. They tend to be very bland and extremely low fat. They are not tasty and don't have good mouth feel. Your ice cream looks very good! This looks beautiful! I've been trying to think of ways to make ice cream without the dairy (not intolerant, but trying to cut back). Thanks for the recipe! Interesting!! I had never really heard of it until this winter! Makes sense that homemade is better, though! Totally! Coconut milk ice cream is easy and you can throw in any flavors to go with - just make sure you add enough coconut oil/butter/egg yolks to make it smooth and soft! You can also make ice cream without an ice cream maker. Put the mixture in a container in your freezer. You have to be able to hang around your freezer to stir it every hour until you like the consistency though!